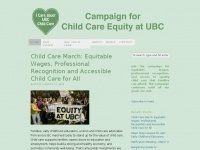 Join us as we work together to achieve our goal of gender pay equity at UBC Childcare Services, without a raise in fees for families or reduction in spaces for children, by March 8, 2013 - International Women's Day. The web server used by Childcareequity.ca is located near the city of Brea, USA and is run by New Dream Network, LLC. 18 other websites are located on this web server. Most of them are provided in the english language. The websites of Childcareequity.ca are served by a Apache server. The content management system WordPress is used. The markup language of the website is XHTML 1.0 Strict. Due to the robot information on the webpage, the following actions by webcrawlers are not allowed: using the description of the website from the Open Directory project and using the description of the website from the Yahoo directory. All other actions by webcrawlers are allowed.